Initial efforts to halt the devastating disappearance of the sea urgently need reinforcement. The consequences have been devastating on an environmental, economic and social level. Ecosystems have been destroyed. Land once deep under water has been turned into desert, which has become the source of ravaging dust storms. Fresh water supplies have been dramatically cut. Fishing villages find themselves isolated, many miles from the water that provided their livelihoods. The lives of many thousands of people who once depended on the basin have been ruined. The effects have also led to health issues for the local population, including cancer and kidney diseases. This is due to the dust storms blowing across the region, carrying toxic dust contaminated with salt, fertilizer, and pesticides. The next generation has also been affected with increasing infant mortality rate in the area. The situation for the future remains uncertain. The fate of the population will remain unstable unless the problem of environmental degradation and the distribution of water is not solved urgently. All, however, is not lost. In recent years, Kazakhstan – which along with Uzbekistan borders the Aral Sea – has put a huge effort into reversing this terrible trend. In 2003, the Kazakh government, in cooperation with the World Bank, began work on the joint $64 million Northern Aral Sea restoration project. This includes the eight-mile Kok-Aral dam, completed in 2005, which allows water of the Syr Darya to accumulate and helps restore delta and riverine wetland ecosystems in the Northern Sea. The efforts have reaped rewards. The northern part of the lake, which lies in Kazakhstan, is slowly reviving. Water levels are increasing. Fish stocks have recovered far faster than was forecast. A World Bank report last year found fishery output, which amounted to just 52 tonnes in 2004 had reached over 4,000 tonnes by the end of the decade. Now many rural people and fishermen have come back to the north Aral region. Life is slowly reviving. With the right help, nature has shown it can fight back. We are determined to build on this success. We understand that Kazakhstan, of course, can’t save the lake by itself. Which is why Kazakhstan’s President Nursultan Nazarbayev has been the driving force behind the creation of the International Fund for Saving the Aral Sea (IFAS) that includes Kazakhstan, Uzbekistan, Kyrgyzstan, Turkmenistan and Tajikistan as its members. 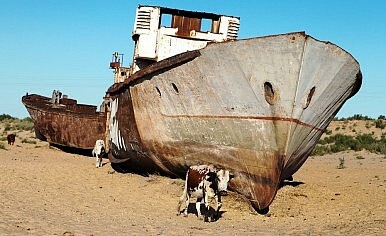 The Fund provides a platform to improve dialogue and find solutions to the many challenges of the Aral Sea. The Summit of the Central Asian Heads of State on April 28, 2009 under the chairmanship of President Nazarbaev was an important milestone in promoting regional cooperation to overcome the consequences of the tragedy of the Aral Sea and to more effectively manage shared water resources. The five presidents expressed readiness to further improve collaboration on trans-boundary waters, taking into account the mutual interests of all Central Asian countries. Under this statement, several Agreements and Memorandums were signed between the Executive Committee and UN donor organizations. These documents enabled the creation of a new Programme for the Aral See Basin (ASBAM-3), which was adopted by all Central Asian governments and the donor community. Its financial potential is estimated to exceed $2.5 billion. We urgently need to step up these efforts. The signing last year of a ground-breaking Memorandum of Understanding between the IFAS and the World Bank, aimed at improving water management and tackling social, economic and environmental problems in the wider Central Asian region, was a symbol of an increased desire for cooperation. We have to be realistic. Water levels are sadly now unlikely to return to pre-1960s levels. But the success so far of the steps taken by Kazakhstan and its partners – and the increased desire for cooperation – can halt the current trend and prevent the lake from disappearing altogether. Failure to achieve this ambition would have devastating consequences on our region. We are not prepared to accept such an outcome. Instead, we will continue with our efforts to breathe new life into its waters and help secure livelihoods of those for whom the lake has been home for generations. Prof. Saghit Ibatullin is former Chairman of Executive Council of the International Fund for Saving the Aral Sea (2008-2013), and currently Vice-Chair of the Implementation Committee under the Water Convention of the United Nations Economic Commission for Europe.